Legions of Utahns are in a similar condition, more or less: 56 percent are overweight, 21 percent are obese. A casual survey of any food court in the valley suggests the Word of Wisdom should be amended to include junk food. I can’t speak for my fellow chubsters, but I have spent my life fending off obesity. I have endured diet fads of every kind and jogged thousands of miles. For years, I spent my lunchtime puffing around a track. By dint of suffering and denial, I managed to stay on the shy side of obese. The problem, of course, is that beyond monastery walls, discipline has its limits. The determination that saw me through the tedium of running withers in the presence of carbs. Like Oscar Wilde, I can resist most anything but temptation, especially if it has butter on the inside or chocolate on the outside. I am a butter junkie, the Keith Richards of carb abuse. A pastry from Leslie’s Bakery, a Hatch Family chocolate, a loaf of Artisan bread, a bottle of burgundy—all are irresistible. Vigilance is the order of the day—every day. 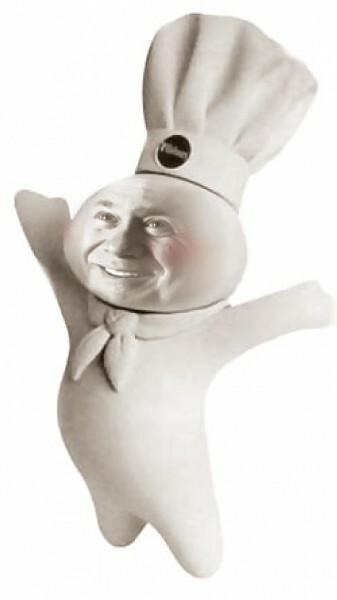 Were I to succumb to temptation, I would morph into the Pillsbury Doughboy faster than Jekyll became Hyde. I used to live in the Third World, a realm of skin and bone. My trips back to the United States were replete with culture shock and the need to recalibrate my sense of the ordinary. It was always a shock to step into the airport concourses in Boston or San Francisco and be jostled by droves of heavyweights, a Big Gulp in one hand, a cell phone in the other. The sheer numbers were startling. You don’t see a lot of big people in developing countries. Now I read that in eight or nine years, most of the people waddling along those concourses will be heftier than I: by 2015, 75 percent of American adults will be obese. That’s a sobering percentage, and it provides even more cognitive dissonance for me to sort out. After all, we live in an age of bottled vitamin water, 24-hour fitness centers, organic lettuce, energy drinks—not to mention pre-emptive war. How is it that we are going to seed? To be sure, we are more Salt Lake City than Sparta, but it seems like most of us should be lean. The fact that we are heading in the opposite direction is puzzling. I suppose you might be tempted to chalk it up to gluttony, one of the deadly sins. We Americans are certainly gluttonous when it comes to oil and the world’s other natural resources, and we damned sure are fond of the super-size option in fast food, cars and houses. On the other hand, it could be the cumulative effect of too many hours on our backsides. Americans watch an average of eight hours of television a day. Add in video games and the Internet, and most of our days are spent sitting or sleeping. It may be related to shrinkage. The Associated Press recently reported that Americans are no longer the tallest people in the world. We used to be, but we’ve been shrinking since the early 1950s. The Dutch are now the world’s tallest. At 6 feet, on average, the Dutch are 2 inches taller than we are. The article went on to assert that short people are less healthy and less affluent than taller people. Tall people also live longer. Is it not worrisome that most of us will soon resemble Danny DeVito? The pathology of obesity includes a surprising social dimension. A study in the New England Journal of Medicine finds that obesity spreads like a virus among friends. If you hang out with Paunchy and his pals, you have a 6-in-10 chance of being overweight, too. The truth of the matter is that there is no single remedy for our height and weight problem. Genetics and hormones play a role in obesity, and children’s diet is a prime factor in determining height. However, if my own case is instructive, then the lesson is that discipline makes a difference, at least with regard to girth. Osama bin Laden—our tall, rail-thin nemesis—has been living in a cave for five years. That’s discipline! If we want to win this War on Terror, we need to take a lesson from the enemy. In 1961, President John Kennedy made physical fitness a national priority to offset the fact that “easy living is sapping the strength and vitality of our children.” At Highland High School, we competed for an embroidered Presidential Fitness Award in a regimen of push-ups, sit-ups and running. We weren’t particularly happy about it, but we weren’t given a choice. We were youthful Cold Warriors, after all. Now is the time of the hot war. The doctrine of pre-emption that America has adopted requires sacrifice and discipline from all of its citizens, not just those wearing uniforms. We would be well served with leaders like Kennedy who recognize that the so-called obesity epidemic may be as much a symptom as a disease. John Rasmuson is a freelance writer in Salt Lake City. Private Eye will return next week.